Created with the aid of feedback from the launch of the Planner web app, the iPhone version can be used to view and update any existing plans on a user's account. The collaborative tool lets managers of a project organize tasks into different buckets, with other categorization options also available, before assigning them out to other members of the team. Users can see a list of all the tasks allocated to them, as well as the status of tasks being performed by others, and can update the task when required. The tool can also allow users to communicate with each other about tasks without leaving the app, including attaching photographs relating to the project. While the app version does offer many of the same functions as the web app, Microsoft advises more functionality will be added in the coming months, such as push notifications and integration with Intune. Currently, plans have to be created in the web app before being viewable in the mobile version, but a future update will change this to allow iPhone users to perform the same action. Planner is currently rolling out to customers on the Office 365 Enterprise E1-E5, Business Essentials, Business Premium, and Education subscription plans, but not for personal plan subscribers. Accompanying the iOS version, which requires iOS 9 or later and is a 58-megabyte download, an Android version of the app is also available to download, free as part of the subscription. The release of Planner is the latest in a number of mobile apps created by Microsoft, to expand its Office 365 footprint. 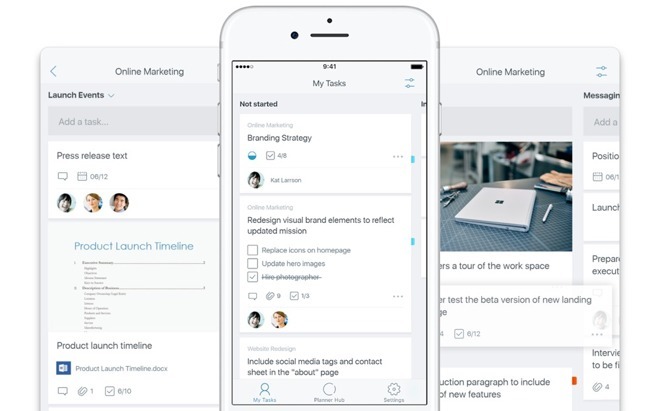 In April, the company released a preview of To-Do, a task app replacing the multi-platform tool Wunderlist that Microsoft acquired in 2015.